In an effort to build relationships and foster communication between students and their parents, our team’s task was to complete a mock UX project for the National PTA; scope and design a digital product that helps parents participate effectively in their children’s academic lives in middle school and high school. As a team, it was important for us to talk through the assumptions we had about parental involvement within our own academic success so that we could try to limit our personal bias once we dove into the research. We recalled how our parents helped us through school and agreed that some monitoring and accountability was helpful for our growth. However, over-controlling parents can end up adversely affecting performance and have an emotional toll as well. Once we reviewed the brief and talked through our assumptions we took a look at the current landscape. We spent the week reading about why and how parental involvement had a positive impact on children’s academic success. We researched the competitors that already existed in the marketplace and identified gaps within their experience. Most importantly, we conducted several interviews with parents, middle school and high school students and educators to hear about their experiences and learn what was missing in parent/student interactions at home. How are parents and students talking about school? What’s working and not working? How does it differ depending on grade level? What do parents wish they knew more about? What do teachers wish parents knew more? What tools are being used in the classroom? At home? We learned a great deal about why parental involvement was key. We also had a much better understanding of the products that existed to keep parents in the know. However, we still needed to talk to potential users and subject experts to hear firsthand about communication at home. Our user interviews were key to figuring out the problem we would ultimately design for. We spoke to 14 people- five educators, five students and four parents over the course of a week. It was up to our team to find and recruit users, which was an overwhelming part of the project since we had little time. Fortunately, I had quite a few educators, parents and current students in my network which helped tremendously with recruitment! We made sure to avoid biasing our interviews by making sure whoever from our team conducted the interview did not personally know the interviewee. My partners Neil, Joan and I are mapped out our insights to help make sense of all of our interview data. We separated insights by user type and started to hone in on the key trends. "I want to be involved, but I want to be involved in the right way." "Since moving from 8th grade to freshman I’ve become more independent … They know the basics and I control everything else." "I wish there were more programs for these curriculums that allow parents to understand how to help them with this at home." Interviews with educators turned out to be an invaluable source of data. They were able to speak to what was lacking on both sides of parent/student communication. We also discovered how incredibly overworked teachers can be and the right level of parental involvement at home made a huge difference in a child’s performance. After noting all the major takeaways from our interviews, we felt confident we uncovered who we should design for. 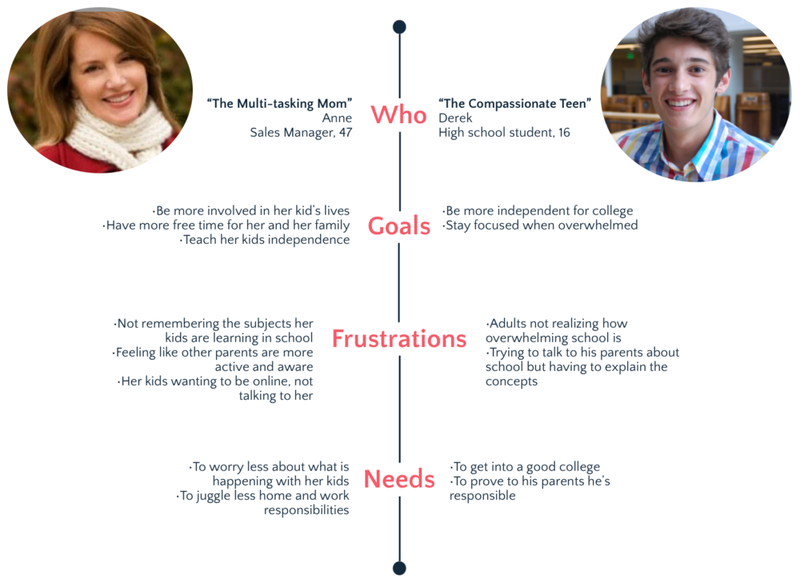 Using our interview research we created two personas to more clearly define our user’s needs and motivations. Creating our personas helped to humanize our users and identify the major pain points in their daily lives. I focused on creating our parent persona, Anne. Our team’s goal at this point was to design a product that would help to resolve these pain points for Anne and Derek. After creating our personas we had a clear understanding of the key issues that were preventing more interactions at home. We crafted a succinct summary of the problem we identified. Well-intentioned parents need guidance on how to more actively relate with their students. They want to be engaged in their academic growth, but often don’t know how, how much or what type of support their child needs. Making positive interactions easier will benefit both parents and students directly. Defining our problem was incredibly useful because it helped us find our scope. We knew that parents needed suggestions on what to talk to their kids about in a quick and easy way. Ideally, getting parents and students to talk more naturally about school would benefit everyone. We referred to back to this statement constantly to ensure every decision we made moving forward was to help develop a solution to this problem. We also outlined a set of principles to influence and guide our design decisions to make a product that was mature for all audiences, personalized and easy to learn. At this point we had our users, our problem and guidelines to inform our next steps but we needed to dive deeper into the lives of our users. We needed to visualize and map out how the motivations, needs and frustrations we identified fit into their typical day. We mapped out a “day in the life” for both Anne and Derek. We started to add in the opportunities points to visualize when and how communication at home could be improved. This was where we were able to develop ideas to bring those opportunities in the journey map into a digital product for parents and students. We needed to figure out both good and bad ways to get the solution. We decided to do a few whiteboard exercises to discover directions for inspiration. During out whiteboard sessions and using the opportunities outlined in our journey maps, we landed on three concepts that we wanted to pursue and build out further. All of the concepts were an attempt to address the defined problem in a through a different lense. During user interviews, I was drawn to the fact that parents were frustrated because they didn’t have time to relearn what their kids were learning. This made it difficult to talk with them about school. Also, we heard from quite a few students that one of their biggest frustrations was taking classes that didn’t seem important to them now or ever. I thought it could be useful to deliver a short bit of content that reminded parents about a concept their kids were currently learning and provide an anecdote about how this concept related to something cool or exciting in the real world. RealClass would be a source of information for both parents and students to drive more conversation at home. Did they understand the concept? Was this useful for them? Would they use it on a regular basis? Did they think it would help with better communication at home about school? Would they use this with their parent/child? 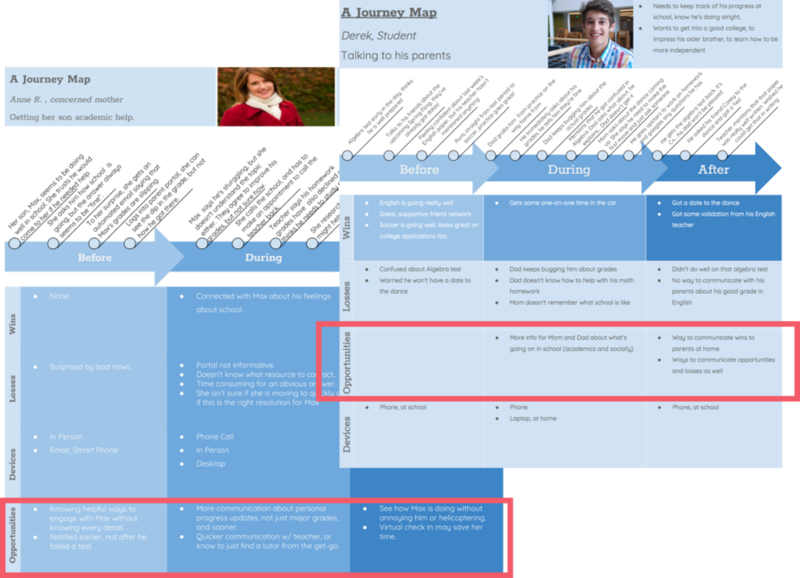 Over the two test cycles we interviewed 4 parents and 4 students in middle or high school. Users were impressed by its unique features but DinnerDriver scored lowest of all three prototypes in terms of daily use between parents and students. Key features from SeeDo and RealClass tested unanimously as most useful for parent and student interaction, becoming the base for our converged design. Once we had our testing insights, we worked to take the successful features from our concepts and combine them into one app. Users responded positively to the calendar functionality of SeeDo and the daily concept brief from RealClass, so we combined those features. Our final, converged concept was Tally, an app where parents can have a forward facing view of a students’ agenda and what their thoughts are about upcoming events. A key feature of the app includes a daily digest of concepts students learn in school so that parents can refresh their knowledge and students can solidify their understanding. The clickable prototype for Tally can be found here. Although we came up with a final design for Tally, there were a lot of ways we could have continued developing the concept and the overall experience of the app. In the short term, we needed to test the converged design with more users to further validate the concept and make iterations to improve the functionality and overall usability of the app. Longer-term, there were additional features to build out based on user feedback. Currently, parents can only view the thoughts that a student writes on an agenda item but parents need to be able to reply and respond to a thought to promote positive encouragement. Additionally, we want to re-test and explore other ways of displaying the trivia section on the daily pop. At this point, this section gets lost among other content on the Daily Pop page. The goal is to create a more engaging experience between parents and students with this feature so we would want to give it more prominent placement and allow for more friendly competition. I learned a ton about the design process, teamwork, as well as my own strengths and weaknesses during this project. During these four weeks, I realized that my interests and skill set leaned more toward the research and concept development part of UX design. I truly enjoyed interviewing and testing with people; it’s incredibly rewarding to hear directly what they need and what they like then tie the common threads together. I also started to understand where I have opportunities for improvement. I’ve made it a goal for myself to continue to work on translating my ideas and concepts to solutions through sketching and building wireframes. This is one of the biggest hurdles I continue to face since transitioning into design but I continue to find new ways to practice!